The esteemed founder of this enterprise had an all-too-common experience with a cheese steak in the Bay Area of Northern California. As I have said in the past, I am forever intrigued by geographically-famous sandwiches, and perhaps equally as intrigued by sandwich shops that appear to be a bit out-of-place. 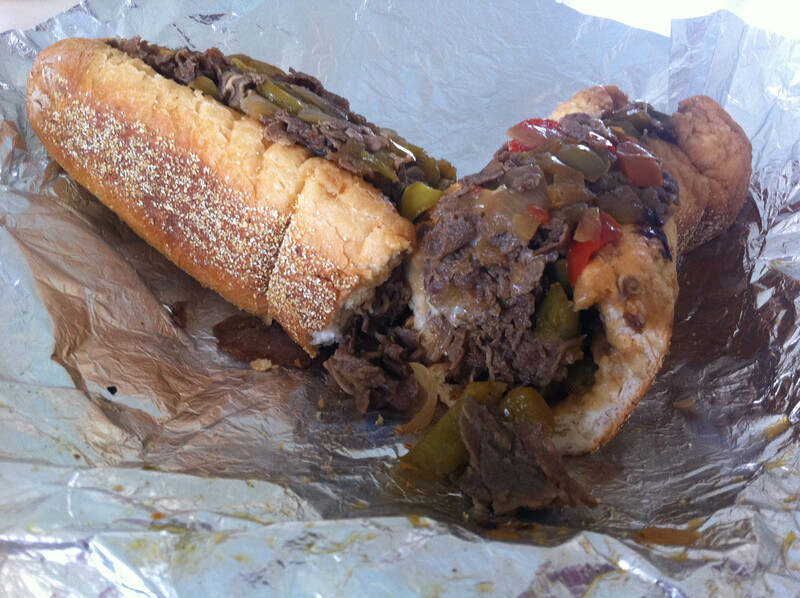 Since I have never visited Philadelphia, I have never had the opportunity to have a “true” cheesesteak, or indeed even a tasty approximation thereof. Finding myself in North Carolina, and finding my initial destination of a deli closed for renovation, I spied Outer Banks Cheese Steaks tucked away in the back of a shopping center. I figured, since this was as close to Philadelphia as I was liable to get for the foreseeable future, why not give it a whirl? My first order of business was to find out how authentic an operation this was. I inquired as to the use of Cheez-Whiz. The woman manning the counter and the grill (for they were nearly one and the same) replied, in moderately offended tones, that the cheese in use was provolone. I opted for the classic cheesesteak, and further opted for onions and peppers, as I feared a large roll filled with steak and mild cheese would be too monotonous. As it turned out, the roll was the tastiest part of the sandwich. A true grinder, it held the sloppy components admirably and provided pleasing flavor and texture. The rest of the sandwich was bland, bland, bland. The grilled vegetables had nearly no flavor at all, and the cheese was somehow lost, even though the steak appeared to have been minced and cooked with no seasoning whatsoever. It was sustenance, to be sure. But one wonders as to the value of a large amount of nearly-flavorless food. This entry was posted in General Sandwich Discussion, Sandwich Reviews and tagged Beef, North Carolina, Outer Banks, Reviews by Bill, Sandwiches I Have Eaten, Steak by bengrimm. Bookmark the permalink.